Erin Katzner’s passion for birds started as a teenage volunteer at the Columbus Zoo and Aquarium in Ohio. Later she was hired as a member of the zoo’s education team where she trained animals in a variety of natural behaviors for educational shows. After graduating from The Ohio State University with a B.S. 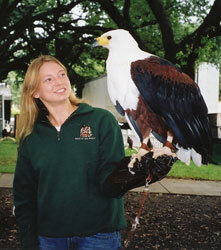 in Wildlife Management she spent 9 years working at the National Aviary in a variety of positions including Curator of Animal Training, Manager of Animal Programs, Media and Community Spokesperson and Assistant Director. After earning a Masters of Public Policy Management specialized in Nonprofit Management at the University of Pittsburgh, Erin worked for Leadership Pittsburgh, Inc. and West Virginia University’s (WVU) Department of Public Administration. While living in West Virginia, she co-founded the Avian Conservation Center of Appalachia (ACCA) in Morgantown. Erin is an active member of the International Association of Avian Trainers and Educators (IAATE) and currently holds the position of President within the organization. She has been accredited as a Certified Professional Bird Trainer by the International Avian Trainer Certification Board (IATCB) and has successfully completed Natural Encounters, Inc.’s (NEI) Bird Training and Show Production for Professionals Workshop. She also has assisted in scientific field research in Kazakhstan and North America. Erin is excited to be a part of The Peregrine Fund’s passionate and talented team. She believes that the combination of the organization’s unique history conserving raptors world-wide and the Boise-based World Center for Birds of Prey educational facility are a perfect platform to inspire a next generation of conservationists. Her goals at The Peregrine Fund include engaging with the Boise community to spread the word about birds of prey and the incredible work being done by the scientists at The Peregrine Fund and bringing even more Idahoans into the raptor conservation community.